It doesn’t take long to get accomodated to a new place if you are lucky enough to stay for good. But in our case, we knew we had to go back soon. No matter how much fun you are having, the thought of going back never leaves your mind, it’s stuck somewhere in the back of the head, pecking you everytime you look at a clock, calculating the time you have left. Between ‘Wow, a few days off, let the party begin, woo-hoo..’ and ‘ Do we really have to leave tomorrow morning’ is always a mere moment. Not so long before out trip I’ve read a very interenting book about the WW2. It was so vividly written I dreamt at night I was flying planes and rescuing the wounded, I was defending a bridge and it was me marching under the command of John Frost. Since Arnheim, where this Market-Garden operation took place, wasn’t that far off from our route, we took a turn and went to see this famous bridge. We grabbed thai nuddles on the way and went exploring. The abandoned looking town changed after 4 o’clock, people started appearing from alleys and office buildings, living a normal work day, accompanying just another Monday to its end.’ Well, isn’t this nice,’ I thought when I saw a girl, by the look of the fancy briefcase probably a banker, lighting up a joint and getting on a bicycle, shouting something funny to her friends. It’s not the new of the buildings or cleanliness of the streets, it’s not the availability or the convenience of the public transport, the kindness of public workers or helpfullness of tourist workers, it’s the smile of a local that can make you feel at home. And compared to generic photos infront of numerous monuments, these are memorable details that last longer and shine brighter. Funny thing is, I can vividly and colorfully remember this girl, but I’m unable to picture one bit of the apartment we slept in that night or the woman kindly letting us sleep there. We did come late and leave early plus nothing really memorable happened there, positive or negative. And I checked with Mitja, if maybe a had some suppressed memories but no. It was quite easy to find, it was in a normal looking block of flats, with an average staircase and nothing unusual inside the flat. I have a vague memory that I wasn’t able to figure out the shower fawcett while Mitja mastered it immediatelly but that might have happened any other time as well. I am sure though, that our host helped us immensly with route planning, saving us hours on driving back. ..driving home.. Damn, the most dredded portion of any travel. I have a feeling that perpetual travelers are just posponing the going back part for as long as possible. I’m always glad to be going home but the way there is a torturous eternity. And the closer you get, the longer it feels. You find yourself counting the kilometres alongside GPS, the closer you are and while you recognize more and more stuff, you can’t really think of anything else than a warm bed at home. 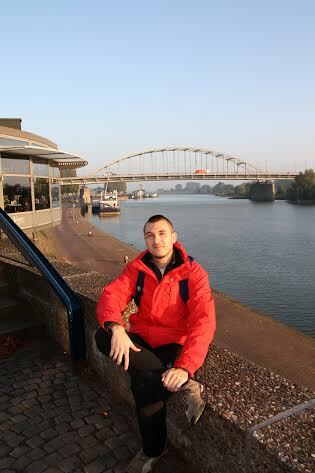 This entry was posted in Amsterdam, couchsurfing, Germany, going back, motorized wehicle and tagged John Frost bridge, operation Market-garden, returning home by feminina9si. Bookmark the permalink.